Volkswagen has kicked the sand off a brand new generation of campervans, debuting the Caddy Beach as the cheapest campervan on sale in Australia. Volkswagen Australia’s director of commercial vehicles Ryan Davies said at the launch that the $46,990 Caddy Beach is the “most affordable and the cleverest recreational vehicle on sale today”. “It is a return to our roots – an inexpensive and fun campervan much like the original Kombi,” Mr Davies said. Size-wise, the Caddy competes in the same space as the Citroen Berlingo and Renault Kangoo. 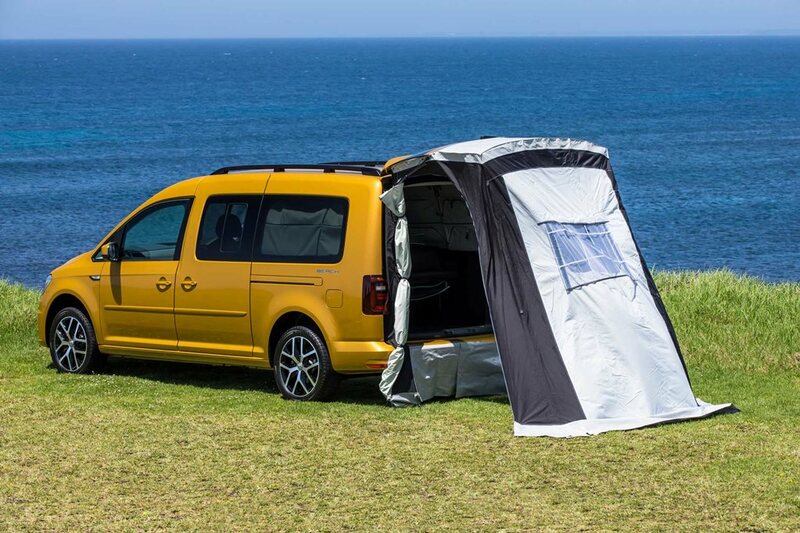 Based on the proven long-wheel-base Caddy Maxi Trendline, the Beach scores a fold-out bed, a walk-through tailgate tent, clever ventilation, block-out curtains, plenty of storage and bespoke compact camping equipment. Best of all, and somewhat uncommon to camper fitouts, it remains a true five-seater thanks to clever folding rear seats. The modular layout offers a fit-and-finish as good, if not better, than any aftermarket option, and if you so desire it can all be removed, returning the Beach to a standard Caddy. Volkswagen’s 1.4-litre turbocharged four-pot petrol engine drives the front wheels through a seven-speed DSG, putting out 92kW/220Nm. The Caddy Beach also comes standard with plenty of tech including autonomous braking, adaptive cruise control, lane assist, and an infotainment system with Apple CarPlay and Android Auto. Maintaining its commercial vehicle roots, the Caddy Beach will tow up to 1300kg while still offering up 3880 litres of cargo volume behind the first row of seats. This scaled-down camper is less about travelling Australia for months on end, though, and more about getting out of the city with the surfboard for a quick overnight escape. Veedub’s Caddy ‘Shack’ makes public appearance.